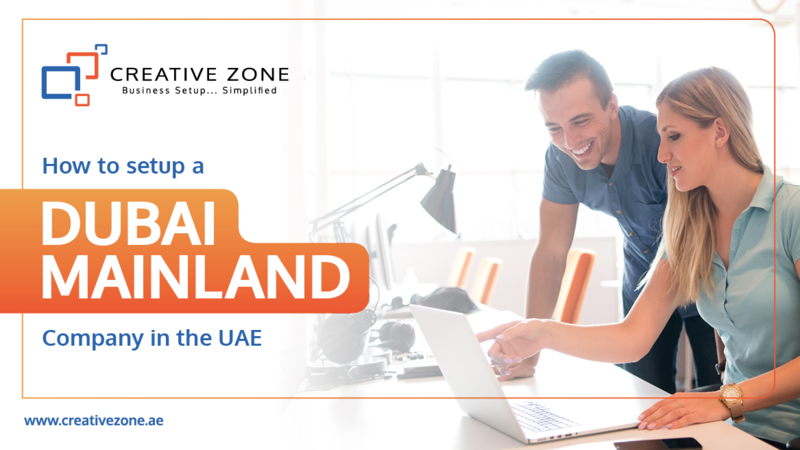 A ‘mainland company’ or DED license is a legal entity that can conduct business operations and transactions throughout the UAE and in other countries without restrictions. UAE Companies Law dictate that expatriate shareholders must nominate a local service agent or a local partner (sponsor) to setup a mainland company. In the case of a Limited Liability Company LLC (i.e Commercial Trading entity) the local partner must hold the majority equity share – a minimum of 51%. A favourable and legal alternative to a local partner acting as the 51% local sponsor, is to choose a corporate nominee partner. This provides expatriate shareholders with 100% financial and operational control and stronger legal rights. The obvious benefits of corporate nominee partnership include complete control of the business operations, 100% of financial benefits, and of course stronger legal contracts aimed at protecting the interests of the business owner and respective shareholders. We at CREATIVE ZONE offer that local partner service as a 'corporate nominee partner or entity'. Therefore the shareholding of the 51% falls under this new entity CREATIVE ZONE General Trading LLC, rather than a local individual. The main benefits of local partner being a company and not an individual are firstly, you are taking out the emotional relationship of dealing with an individual from both sides of the relationship. So as a corporate nominee partner, the foreign company is complying with UAE Companies Law and you deal with a corporate entity with a structured board and a power of attorney over this company rather than a local individual. Why Setup a Company in Dubai Mainland? Our DED advisory team will provide you with transparent and concise advice on all aspects of mainland company formation covering structures, licensing and business activities. Our customer service management team provide efficient ongoing advice and support ensuring you can simply focus on the day to day operations of your business. Schedule a free consultation with one of our Dubai Mainland company formation specialists today.